The Sumiyoshi Taisha shrine, which has over 1800 years of history attached, is known fondly as ‘Sumiyoshi-san’ by the people of Osaka. Behind the beautiful linear design of the main temple, 1000 year old Camphor trees are enshrined. The spirit of business success ‘Hatsutatsu-san’ at the Nankunsha shrine. Hatsutatsu means the first day of the dragon of the month and originates in the old Japanese calendar. It is believed that if you visit the shrine on that day then your business will flourish. 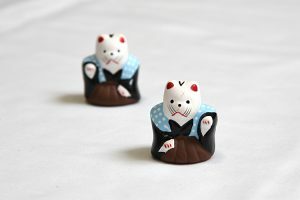 You receive a beckoning cat as evidence of visiting the shrine which on odd months will be with its left arm raised to beckon people, and in even months, its right arm raised to beckon money. This small cat of just 3.5 cm in height might just give you the protection of the gods.